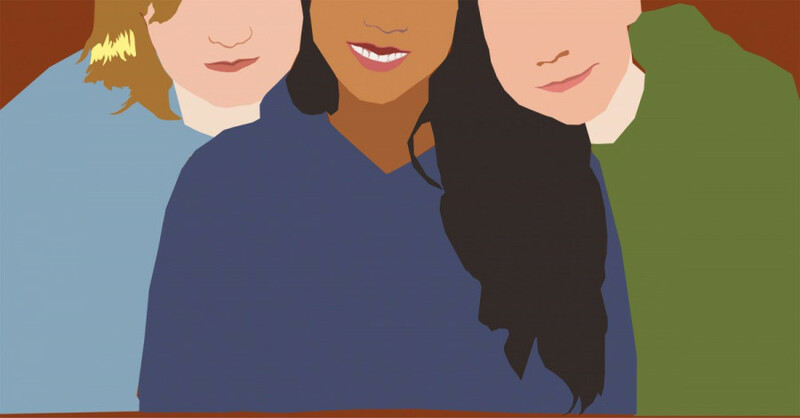 Now, more than ever, mixed-race families are a celebration of diversity and multicultural acceptance—but what happens when you are the odd one out in a sea of white faces? That’s right, I’m a brown kid in a white family. My biological father is Thai, while my mother is a white American. My biological father and I have never met, and my mother went on to marry a French-Canadian. It didn’t occur to me for a very long time that there was something about me that differed from the rest of my family. For most of my childhood, I never saw my skin colour as anything distinctive. My younger sister and I attended the same small private school where the number of non-white students could be counted on one hand. I remember laughing at the confused looks on my friend’s faces when I introduced my siblings or showed family photos. The same question always followed. Nope. The short answer is that I do not have the same biological father as the rest of my siblings. I’m as close to my brother and sisters as I could possibly be, and there isn’t a single common physical trait among us. Spending several years in Canada’s Eastern townships has taught me a few things about being a person of colour. Standing out because of my skin colour makes me seem like somewhat of a relic, an exotic, collectible item. Sara Ahmed, an academic on feminist, queer and critical race theory, explains in her book Queer Phenomenology: Orientations, Objects, Others, that when a child does not resemble their family members due to skin colour, an explanation is owed to the world. Pigmentation sets that child apart from the rest of the family and they become outcasts. My family members have never made me feel awkward about my skin colour, but I can understand why an outside observer might have a hard time placing me on the social spectrum. Human beings like to sort people into groups based on characteristics that they share. Psychology professors Roy F. Baumeister and Brad Bushman explain in their book Social Psychology and Human Nature, that this is referred to as social categorization. That being said, I’d like to be able to say that I am a part of a group—but do I identify as Southeast Asian? I have no connection to my ethnic background. In my entire life, I have never met a person of Thai background. I have never visited Thailand and to be honest, I know next to nothing about its culture. As a child, I tried to identify with groups solely based on my skin colour. I spent my younger years in Panama City and learned Spanish, which often leads people to believe that I am of Latin descent. During my first years of schooling, I used this to my advantage in convincing my classmates that I was Panamanian. I acted like them. I even spoke in broken English. I remember the stinging embarrassment I felt on the day that my mother showed up at my school with my lunch box and spoke to me in English. From then on, things were different. In a sense, I didn’t feel like a part of my classmates’ “group” anymore. I was too white. When moving to a small French-Canadian town with a 95 per cent white population, I once again adapted to my surroundings. The thing about spending years almost completely surrounded by white people is that race discussion becomes non-existent. People felt uncomfortable addressing it. You hardly notice this fact until you are taken out of that environment. But what if the only common factor between a group and me is that I look like them? Where do I fit in then? Walking to a bar on an autumn night, a friend once asked me if I identify as a person of color. The question took me by surprise. So I asked myself, what is a person of colour and am I allowed to call myself one? As a journalist, my first inclination was to ask a bunch of people what they thought. I asked a variety of Concordia students of different ethnic backgrounds what they thought a person of colour is. I then asked them if I was one. All of the people I asked identified me as a person of colour. In an age where race and self-identity are among society’s most debated topics, I find myself at a loss for words. I don’t know where I fit in. So in deciding my own identity, I have come to one conclusion. I am okay with being confused. I haven’t chosen to ignore my ethnic background, on how I am viewed. I have simply decided that I am not going to let it be the only factor in determining where I belong—or whom I belong with. There’s more to me than skin colour, and it doesn’t make me particularly special or different. Nobody should ever be made to feel that their ethnic background or racial identity limits them in any way. Maybe the first step in resisting other people’s impulse to categorize me is to not categorize myself.